At the April Bee Night Laura taught us the new technique of self binding baby blankets that you see here. The self binding method is quick and easy and produces surprise mitred corners after a few strategic stitches and clips. 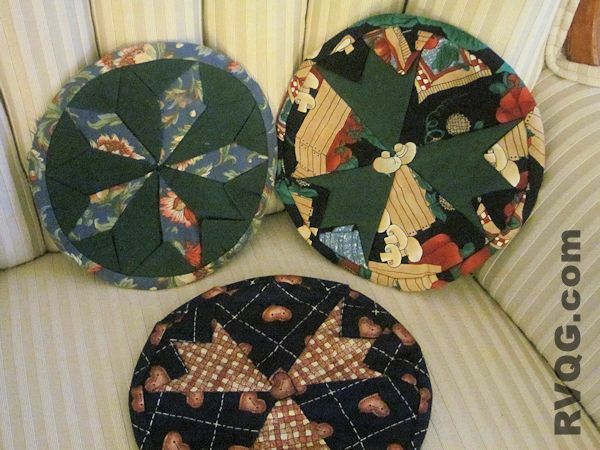 This method can also be used to make other handy gift ideas as well such as table runners and placemats. Please click the link or scroll down for more great photos from April, and a preview of the next project for May! Other baby items and breast pads for nursing moms were also available to make at the session. Lots of laughter and oohs and aahs this night ! These make great hostess gifts – your choice of fabric and colours make the gift a personal one. You may sign up at the general meeting on April 22. Janet and Terry have done a great job organizing Bee Night over the past two years. Did you know that they did not know each other well before they took on the job? But they both agree that it has worked out very well. We have one volunteer for next year, Elaine, but she too is looking for a partner. 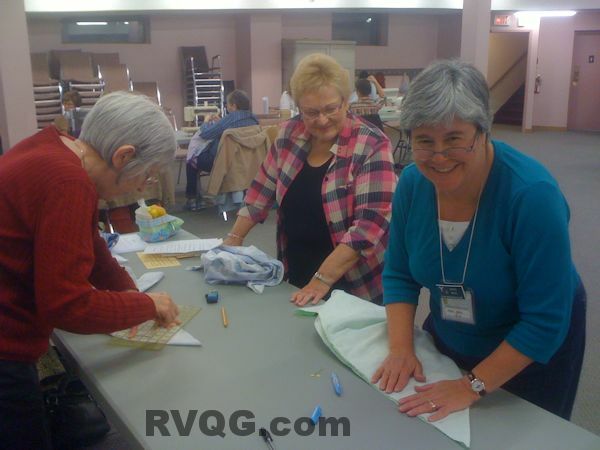 Please email us at rvqginfo@gmail.com to learn more or to volunteer, or give Janet or Terry a call directly.